I have prepared two Excel tables with data and many tasks to use COUNTIF(S) and SUMIF(S). Each task contains also the result. The first table contains Orders and Transport information. Data come from a big wholesale of electronics. The second table contains data from Hairdressers and barbers. There is information about each customer in May 2013. What Service, Stylist, Price, Payment and when. Your task is to find some statistical values. The results are included on the third sheet. These exercises are for free and you can use them, change them or copy them. If you find any mistake, please leave a comment. On exercise 2, the total price is incorrect. For example, the total times “shaving” is 71. The cost per shave is $7.00. So 71 times $7.00 is $497. Also the total price by cash is incorrect. Sorry, I just notices that not all shaves are $7.00! PURRFECT I HAVE EXAM TMRW OF ICT N I AM IN GRADE 7! THIS HELPED ME A LOT!!! How to sumif multiple ranges in excel? I have 3 criteria in the table. Thank you so much for sharing this exercise! I found it really helpful and I feel more competent with the use of COUNTIFS and SUMIFS. there are results in each sheet. If you click in the cell you will see the formula. How can I download COUNTIFS example? COUNTIFS and SUMIFS examples are part of this Excel file. Click on the link Free download… to get it. Please give me the answers for this exercises. answers are included in file. Exercise 1 has answers in column H (results). Exercise 2 has answers in separated sheet Exercise 2 – result. 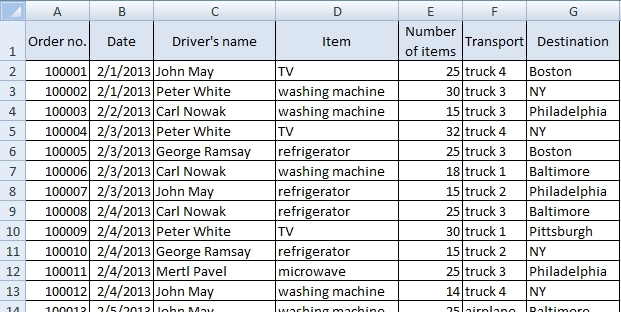 Really simple exercise to learn how to use COUNTIFS and SUMIFS. Sir Can I have the answers for this exercises please? Thanks, with the practice of your exercises I started doing this more smoothly. VERY nice and healthy exercise for the excel beginners. Thanks Sir or Mam, who is behind this. Thank you very much Jan Podlesak. Good job! It is a helpful and useful exercise for learner as me. I hope that you will upload more exercises which are related to all excel formulas! Thanks for the quiz. It has helped my mastery of countifs and sumifs.